U.S. Army Garrison Bavaria Commander Col. Lance C. Varney signs Installation Management Command’s Service Culture Initiative pledge following an all-hands garrison assembly. Hundreds of garrison employees from Tower and Rose Barracks gathered at the Reel Time Theater for an all-hands staff assembly here July 27 to recognize team-led progress and reinforce the group’s enduring mission as leaders in Army community support. GRAFENWOEHR, Germany — Hundreds of U.S. Army Garrison Bavaria employees from Tower and Rose Barracks gathered at the Reel Time Theater here for a garrison all-hands staff assembly July 27 to recognize team-led progress and reinforce the group’s enduring mission as leaders in Army community support. Following an all-hands meeting from January earlier this year, garrison leaders have led a charged community effort to help create a sustainable garrison battle rhythm and maintain positive, supportive work environments for a large and diverse workforce spanning five geographically separate communities, said Annette Evans, deputy to the garrison commander, USAG Bavaria. The overarching effort to improve operations and strengthen team cohesion has used the garrison commander’s long range plan — published late last year — as a foundation and Installation Management Command’s guiding customer service mission, known as the Service Culture Initiative, to enhance the day-to-day workflow, she added. At the last all-hands assembly, garrison employees from all directorates and levels of leadership submitted over 200 cards with recommendations on how to improve garrison services and productivity. Evans followed up on those suggestions and highlighted ten accomplishments the garrison organization made in the last six months. Reduced mandatory annual training for general schedule civilian and local national employees. Cut back the amount of short-notice taskers by requiring command group signature and approval. Launched an automated and digitalized time card program for civilian employees. Created IMCOM-Europe’s first Readiness Welcome Center for incoming Soldiers, families and civilians. Initiated a quarterly command orientation for new employees. Distributed ceremony administration with tenant unit leadership. Redesigned the Soldier for Life Center, located at Bldg. 244, for better customer flow and productivity. Trimmed down organizations’ tasks to prevent duplication of services. Enhanced communication by installing digital phones across the footprint. Extending the Civilian Fitness Program. The garrison command group also stood up a workforce development team to bridge the gap between identified challenges and solutions and lead projects Evans hopes to implement in the near future, including minimizing signature authority for documents, optimizing work hours, reducing paper use, consolidating administrative duties and the improving the background check process. 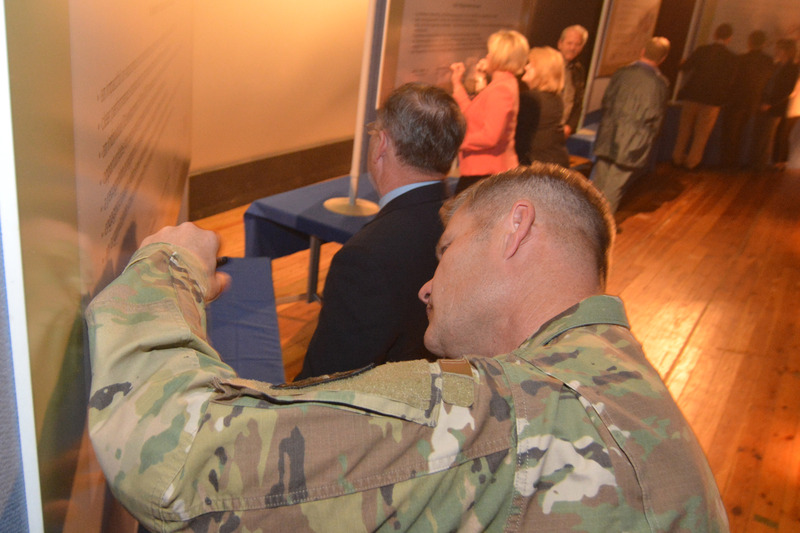 Garrison leaders called on the hundreds of employees to sign a pledge of commitment to IMCOM’s Service Culture Initiative — the “one thread” binding all of USAG Bavaria’s enduring values, and the Army ethic, together, Evans said. The steady improvements and, in some cases, “astonishing” successes accomplished by the garrison are a product of the garrison’s committed, highly-capable team, said 1st Sgt. Michael Toolin, acting USAG Bavaria command sergeant major. Varney and Evans mirrored this sentiment, extending thanks and all owed recognition to Bavaria’s ‘ready to fight’ workforce.